John Keats died in Rome aged twenty-five on February 23rd, 1821 and is buried at the Cemitero Acattolico—the so-called Protestant Cemetery in Rome (1). Two years later, in the early spring of 1823 his gravestone with epitaph was finally laid at his burial site. (2) Much has been documented about Keats’s final days in Rome. The romantic view is that on his death bed, he declared to his friend and carer Joseph Severn, his dying wishes. These were then recorded in letters sent from Rome by Severn. Friends of Keats who were responsible for the epitaph, are principally Charles Armitage Brown (3) and Joseph Severn (4). Years later both were to admit regret for the epitaph. Severn wrote on July 13th, 1836 “…the present gravestone with its inscription is an eyesore to me and more…” (5), while Brown referred to it as “…a sort of profanation…” (6) . These belated pangs of regret help to establish the view that the epitaph was not what Keats wanted. For the purpose of this discussion, dying wishes are defined as what is stated by the deceased and what is recorded before death. It logically follows that it is not possible to have a dying wish post-mortem (after death)—it must be made by the deceased whilst they are still living—ante-mortem (before death). We have to look to correspondence from the period to support the common perception of what Keats’s dying wishes were. The most influential source material that many biographers and historians cite from is William Sharp, Life and Letters of Joseph Severn (7) first published in 1892 (hereafter referred to as “Sharp,1892”). Sharp wrote the biography based on “a great mass of letters, journals, reminiscences, and fragmentary records” (8) which Severn’s son Walter had provided. The biography of Severn’s long and varied life was initially planned to be in two volumes, such was the amount of information. But the publisher baulked at this and insisted that Sharp produce it in one volume only—so the book was somewhat squeezed, with voids of missing years, and a narrow focus on the Keats years either side of 1821. The result is a sanitised version of Severn’s life—the negative played down, or airbrushed out completely, and rough non-complimentary edges smoothed. Whilst it is still an important record (in the absence of anything else) it cannot be entirely relied upon. Sharp had a habit of ‘stitching in’ to sections of the book snippets and paragraphs initially written by Severn, but edited and substantively revised by Sharp. Even for the careful reader, it is very easy to misinterpret—on one page you may have an apparently contemporaneous letter, interlaced with a much later “Recollection” or “Reminiscence” which has been extracted from a Severn memoir, edited or reassembled by Sharp to present a relevant and highly readable anecdote within the narrative. Additionally, Severn habitually added many postscripts to his letters, and it is very easy for the reader to confuse an actual postscript to a letter, with a Sharp “recollection”, based on a Severn “Reminiscence” written many years later. (9) It can become very confusing. Scholars who had access to the Severn papers began to notice discrepancies in Sharp’s interpretation of the material. As far as facts go, we have Severn’s almost contemporaneous letters—particularly those written before Keats’s death—these are relevant, as they are the only record of what Keats’s declared dying wishes were, if any. The significance of this is that Sharp developed the narrative about Keats’s last final days, by interlacing from the “great mass of letters, journals, reminiscences, and fragmentary records” provided to him in the late 1880s. According to the Life of John Keats by Charles Armitage Brown, this letter is actually dated February 8th, 1821 and is addressed to Brown himself. Sharp confused both the date, and Brawne with Brown, but the substance of it does remain relevant, as primary source evidence—in that before death John Keats had declared that he wanted these words on his grave: “Here lies one whose name was writ in water”. Here in Sharp, we have a much later recollection by Severn, edited and enhanced by Sharp for readability, almost seamlessly stitched into the narrative. The aforementioned was proposed perhaps for reasons of dramatic gravitas. In Taylor’s opinion, Keats’s name was not necessary, and that “Here lies one whose name was writ on water” should be the sole inscription. Severn and Brown both picked up on this. The Taylor suggestion was to be later transmuted into a ‘dying wish’ of Keats, although it originated some six months after he had died. To conclude, before Keats’s death we have confirmation in the Severn letter to Brown dated February 8th, 1821 that Keats wanted: “Here lies one whose name was writ in water”. This was the single declared dying wish of John Keats in relation to his epitaph. The idea of the “sole inscription” and “not his name” was instigated posthumously by John Taylor in his August 1821 letter to Severn, and later executed by Joseph Severn. The evidence would strongly suggest that Keats’s dying wishes (such as they were) were duly fulfilled. Keats wanted “Here lies one whose name was writ in water”. He got this, and more. Everything else that appears on the gravestone epitaph was created posthumously by others—and not by John Keats. I am indebted to Grant F Scott, Professor of English at Muhlenberg College in Allentown, Pennsylvania, for taking the time out of his busy schedule to point me in the right direction on some dates to letters and events cited in this paper. For me the most important reference source was his Joseph Severn: Letters and Memoirs (2005) which was a huge help and inspiration. I am also grateful for access to Romantic Circles electronic edition. This is a scholarly resource which features New Letters from Charles Brown to Joseph Severn, Editors: Grant F Scott & Sue Brown ( 2007: Revised 2010). 2. No exact date. Joseph Severn to William Haslam, June 1st 1823 “I have just put up the Tomb to poor Keats—it has cost me £16” p242 ed. Scott, Grant F, Joseph Severn: Letters and Memoirs (2005), Aldershot/Burlington VT: Ashgate. 4. Joseph Severn. Born Hoxton, London 1793, died Rome 1879. Buried Rome Tomb no. 173, Gravestone S32, (Zone A, Plot 65) of the Non-Catholic Cemetery for Foreigners. Painter and diplomat. Met Keats 1816. Travelled with Keats to Rome September 1820. See Richardson pp104-107. For character see also Scott, 2005 ‘The Eternal I’ pp 8-15 & letter 19, p149-151 & letter 48, p246 (underlined text). 5. November 26th, 1836. Sharp, William The Life and Letters of Joseph Severn, (1892), London: Sampson Low, Marston and Co: p165. Ian Reynolds is a retired mechanical engineer who lives in Oxfordshire. He has a personal interest in those associated with the Keats-Shelley Circle, and poets of the Romantic period, especially John Keats. He is unaffiliated. Ian’s other interests include reading, listening to music, particularly rock and jazz, road cycling and wine. John Keats has been viewed by many as the very picture of the romantic poet, destined to die poor and at a young age. He was a man who attracted a devoted group of friends who in many ways promoted that image after his death, at the age of 25, from tuberculosis. Disgusted at the treatment he received from prominent literary critics of the early 19th century some suggested that his constitution had been weakened by these attacks; Shelley wrote the poem Adonais, portraying Keats as victim; Byron, hugely popular at the time and disliked by Keats wrote disparagingly of him as ‘snuffed out by an article’ and later in the 19th century Oscar Wilde still spoke of him as a martyr. Thus the perception of Keats as the archetypal frail, sensitive poet became enshrined in 19th- and early 20th-century consciousness. However, we have written descriptions of him offered by a number of friends and acquaintances in the ‘Keats Circle’ and not one of them suggests frailty or weakness. Poet, critic and friend Leigh Hunt described him as having features ‘at once strongly cut and delicately alive’ suggesting his one fault was ‘in the mouth, which was not without something of a character of pugnacity’. The poet Barry Cornwall (real name Bryan Procter) claimed he had ‘never met a more manly and simple young man.’ Charles Brown, a close friend, described him as ‘though thin, rather muscular’. He had brown hair and hazel eyes and a ‘peculiarly dauntless expression’, Joseph Severn noted, all ‘trembling eagerness’. Others suggested he had an ‘inward’ contemplative look. He was undoubtedly a beautiful young man, but as his biographer Andrew Motion points out the descriptions are always of one ‘at once ‘feminine’ and robust’. Motion has been one of the most recent to write of Keats as a radical, both in politics and in poetry and at last the myth of ‘poor Johnny Keats’ is being erased. John Keats was born in 1795, the son of the manager of the Swan & Hoop stables and inn, Moorgate, now on the main route into the City of London. He was short and stocky and likened to a boxer; indeed as a child at school he was well known as having a quick temper and always ready to fight his, or another boy’s corner. As an adult he was intense and acutely sensitive and alive to the world around him and his poetry is some of the most sensuous in the English language. Yet for all his ability to literally take you ‘out of this world’ he was not, as some believed ‘unworldly’ and incapable of coping with the barbs thrown at him by the press. He had trained as a doctor at Guy’s Hospital when surgery was in its infancy and savage to a degree we can barely imagine and having given up medicine for poetry he then nursed his younger brother Tom, who was dying of TB, without help. He was loyal and selfless as a friend and was reported to have a great ‘sense of fun’. Clearly, the words of important contemporaries and subsequent eminent Victorians played a large part in perpetuating the myth of the weak and over-sensitive doomed youth, but perhaps posthumous artistic images of him played some part too. There are many likenesses and portraits of John Keats, taken whilst he was alive and painted posthumously, often with reference to each other. 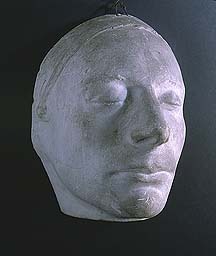 The life mask was taken by the artist Benjamin Robert Haydon in 1816. His younger sister Fanny was particularly fond of this as a likeness, although she thought it had lost something around the mouth; his top lip naturally protruded over the bottom. The picture above is one of the most famous portraits of the poet, a miniature painted by Joseph Severn in 1818 and by way of contrast, the charcoal drawing below is also by Severn and for me is a far more lively portrayal; more representative of the written descriptions of him. The picture below is a pencil drawing by Charles Brown from 1819, the year in which much of Keats’ greatest poetry was written, but just eighteen months before he died. It seems natural and unforced but so different again that the man that is Keats is ever more blurred. 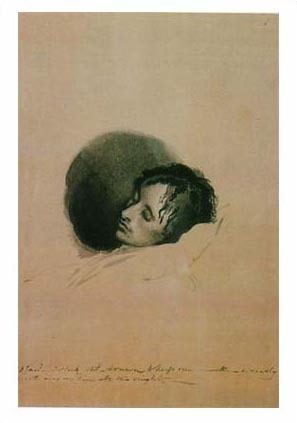 This last sketch is of Keats on his deathbed drawn by Severn to ‘keep me awake’ as he nursed Keats in his final days in Rome in February 1821. This is a tragic portrait. Keats suffered terribly in those last months. He knew he was dying and that there was no hope of recovery but friends supported the doctor’s advice that a winter abroad would give him back his health. So he felt he had to travel with Severn, not a close friend but the only one willing and available, to Italy, away from Fanny Brawne the woman he was passionately in love with and secretly engaged to. He showed anger and bitterness and endured agonies that shocked and frightened Severn. This may be one of the reasons why, following Keats death in February 1821, Severn used his talents as an artist to recreate the sensitive, golden youth; the talented young poet that he preferred to remember and thus this exercise in imagination ensured that representations became more saccharine and anodyne. The portrait above was started by Severn in 1821 and finished in 1823. It is a recreation of Keats in one of his favourite poses, reading in his sitting room in Wentworth Place in Hampstead. Similarly, the one below is Severn again, imagining Keats listening to the famous nightingale of his ‘Ode to a Nightingale’ on Hampstead Heath. For me it bears little resemblance to the portraits above and shares nothing of their liveliness. The painting is a fiction, painted twenty years after his death, and for me a dull one. Then there is the portrait below that I fell in love with as a girl of twelve and which was for many years my ‘photo’ of Keats. I learned later that it was painted around 1822 by William Hilton ‘after’ the miniature of 1818 by Severn shown above. I prefer it, but it most certainly is not the ‘real’ Keats. 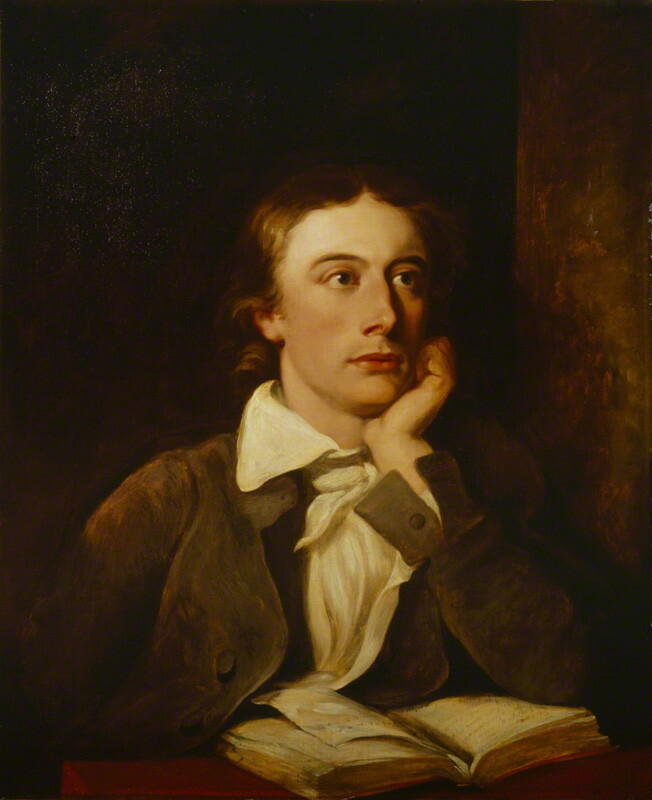 John Keats by William Hilton, after Joseph Severn. National Portrait Gallery. I do not have a detailed knowledge of art or art history, but my sense is that the ‘essence’ of Keats was as hard to capture in paint, charcoal or clay as it was, and still is, to describe accurately in words. During his lifetime the images vary greatly and after his death they take on the status of memorials, romanticized and although on the surface a ‘likeness’ they are in fact as unreal as the perception of him promoted alongside his poetry for the best part of 150 years after his death. 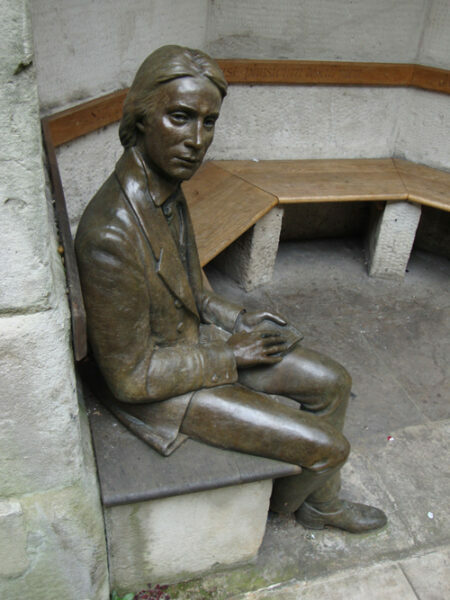 One of the most recent portrayals of Keats is the small statue by sculptor Stuart Williamson at Guy’s Hospital in London unveiled by Andrew Motion in 2007. Stuart Williamson himself suggested it was time to represent Keats as the robust and radical man he was, rather than the passive, sensitive type as he has frequently been represented. I have to say to my untrained eye it is a man older than twenty, but it is important that such a statue to him, by an eminent sculptor such as Mr Williamson, exists. And last, but by no means least, is the depiction of Keats presented in the 2009 film Bright Star directed by Jane Campion. It focuses on Fanny Brawne and her love for Keats, played by Ben Wishaw. It is a wonderful film, and there is no doubt that the actor will, for many, ‘become’ Keats, as the William Hilton portrait became Keats for me. But lovely as Ben Wishaw is, and brilliantly though he played Keats, he provided only yet another version of a reality that has proved impossible for others to accurately bring to life. Perhaps that ‘reality’ should then be provided by Keats’ poetry and letters. I hope that over the course of the next few posts they will explain more eloquently why he is still read avidly by students today and why he is taking his place as one of the greatest poets in the English language alongside Milton and Shakespeare, both of whom he greatly admired and who most influenced him. Suzie Grogan is a professional writer and researcher, working in the fields of social and family history and mental health. Her first book Dandelions and Bad Hair Days: Untangling Lives Affected by Depression and Anxiety was published in 2012 and her second, Shell -Shocked Britain: The First World War’s Legacy for Britain’s Mental Health was published by Pen & Sword History in October 2014. She has two further commissions, including one on the life of an apprentice surgeon-apothecary in the early 19th century, to give her an excuse to write about John Keats. Suzie has a popular blog at No wriggling out of writing and also presents a local radio show ‘Talking Books’ . She is married with two children and lives in Somerset, but has her heart in the Lake District and London.